Simple, high-value gift and giveaway idea. Brushed steel & leather accents add to the perceived value. Great add-on to safety & wellness campaigns. Useful AND on-trend...great brand exposure! You dig around in your bag, fumbling through its contents in the ever-frustrating search for your keys. Or maybe your metal keychain looks like a janitor's, weighing in at 15 pounds with a crummy metal hoop that's always on the verge of busting apart. This will not do. Pinnacle Promotions can help — with the best in promotional keychains. We have sturdy, colorful custom keychains that will keep your keys organized and easy to find while spreading the message about your company. And we're not talking about run-of-the-mill keychains. Our custom keychains come in fun shapes, like a motorcycle or a pig or a moustache or a skateboard. You can pick out cool features, like a flashlight or a bottle opener. We also have promotional keychains with compasses, carabiners, fans, pens, pocket knives, pill cases, and pocket whistles. Pinnacle Promotions and its dedicated account teams understand the need for powerful, cost-efficient marketing. Our dedicated account teams can find the perfect promotional products for you, your business, and your budget. Put your company's name and logo on soft, rectangular custom key tags and your employees and customers will think of you every time they drive. They'll watch their custom plastic keychains sway from the ignition, providing an almost hypnotic calm during traffic jams. They’ll daydream about floating down a river with their Floating Wrist Strap Keyholders. They'll fiddle with the Micro Rubik's Cube Key Holder that has your logo on some of the squares, and they’ll thank you for providing a fun distraction. Everyone uses keys, and they can't get far without them. So why not go along for the ride? 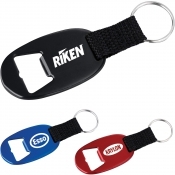 Get a ton of brand exposure from cost-effective promotional metal keychains. Put out personalized carabiner keychains at trade shows and watch them get grabbed up like free Dippin' Dots. Print your logo on a leatherette and silver custom key tag and your employees will feel like they’ve received the key to the city. And when your employees and customers find their personalized keychains at the bottom of their bags, they'll be glad — and they’ll think of your business and your brand.